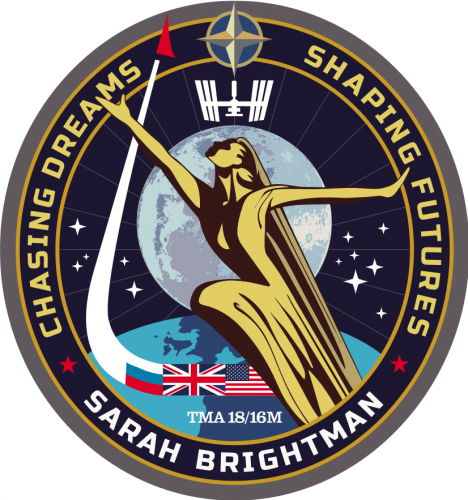 Sarah Unveiled Her Personal Mission Patch this week at her press conference in London! The design captures the classic historic spirit of space travel and exploration, while using a female figure as the central motif – highlighting the potential of women to succeed in the worlds of science and technology, traditionally the preserve of men. The figure is drawn with a respectful nod towards the stylish, heroic aesthetic of 1960’s soviet statuary, in particular the monuments to pioneer cosmonauts such as the first man in space Yuri Gagarin. Similarly, the four pointed star at the top of the design refers to the emblem for Russia’s Star City and the ascending rocket is adapted from the beautiful “Conquerors Of Space” monument which is situated outside the All-Russia Exhibition Centre in VDNKh. At the base of this, the flags of three nations lead the way into the ascent; Russia, the United Kingdom and the United States of America. Behind the female figure is the earth – the most recognizable landmass we see is the United Kingdom, the birthplace of Sarah Brightman. Positioned like a crown above the female figure is the image of the International Space Station itself. Never has the term “Mission statement” been more appropriate. For Sarah, this mission – TMA 18M – embodies her own goals: CHASING DREAMS, SHAPING FUTURES. Sarah’s endless pursuit of realizing her own ambitions is matched by her personal commitment to the advancement of education for young people around the world. She works closely with several organizations that strive to achieve greater opportunities in the fields of Science, technology, engineering, mathematics and the arts, including UNESCO (as an Artist for Peace ambassador), Virgin Unite, (the non-profit foundation of the Virgin Group – as a scholarship benefactor), and Challenger Center (STEM education non-profit organization – as an advisory board member). Sarah is also a supporter of The Andrew Lloyd Webber Foundation, which significantly supports the arts, music in schools, The Architectural Heritage Fund and awards 30 performing arts scholarships annually. Finally, at the centre of the design, behind the female figure is The Moon, which refers back to the Apollo 11 landing. This event had captivated Sarah as she watched it on TV as a child and was the driving inspiration behind her earliest desire to travel into space. The moon also became the predominant motif on the cover of her latest album project, Dreamchaser.